Hi Kristie Taylor greeting you. I put my acrylics away and grabbed my oil pastels for this painting. Oil pastels are so rich and creamy and blend beautifully, especially when layered over absorbent ground. Today I used the Wood Cut Rose stencil by Desiree Habicht as my main image to create a soft pretty spring canvas. It was fun to use several small stencils to add texture and design to the background as well. Here is the finished canvas. It is an 8" x 8" deep sided canvas and will make the perfect gift for a friend. Let me show you how easy it was! Let' s start by giving the canvas two layers of gesso, drying between layers to get a nice smooth surface. Apply two layers of absorbent ground, dry between layers. This gives a bit of something for the pastels to stick to although, you may not even need this, but I like the way the two work together. Choose colors that will blend together and color in swatches onto the background. Use your fingertips to smooth them all together and then, lay down a stencil and use a wet wipe to remove some of the color through the Journal texture #6 stencil by Pam Carriker. this look is very subtle, but I like it. Rub a contrasting color of oil pastel onto your fingertip and rub through a stencil onto the background. I am using a stencil by Mary Beth Shaw from October 2016 StencilClub. Next, we are going to be working on top of this ans rubbing more oil pastels in, and so we don't want it to move. Therefore, we will give it a nice spray with workable fixative (outdoors). 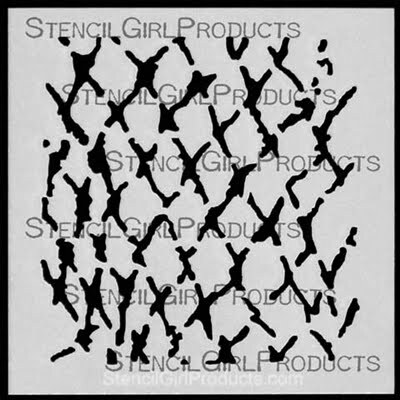 Once that is dry, use your fingertips or a sponge to lightly tap with paint or gess over the stencil. 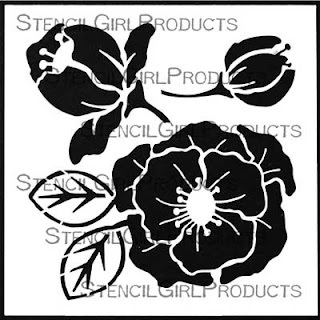 This will give us an outline of the Wood Cut Rose stencil by Desiree Habicht design to go by. Choose the color you want the roses to be, and just start laying on color in layers. Start with the lightest color first and build up, laying the darker color in as shadow last, using your fingertips to blend the colors. charcoal pencil to add highlights. Be sure to spray with one more layer of fixative to seal in the color. And that's all there is to it! Thanks so much for stopping by today! I hope you will use your amazing StencilGirl stencils to create your own oil pastel masterpiece!